Join Us For and Afternoon with Robbie Sherman! Pencil in Sunday, March 15, 2015 from 12:00-3:00pm for this wonderful event and join us for an afternoon with Robbie Sherman! Brunch is included and a cash bar is available. This event will take place at Howl at the Moon, 8815 International Dr., Orlando, Florida 32819. 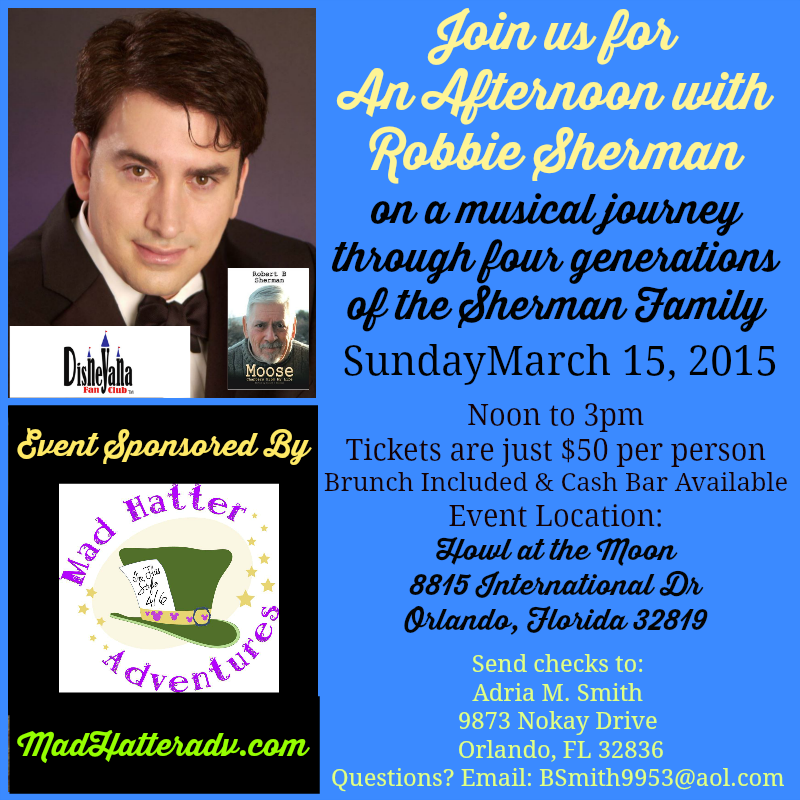 Robbie Sherman will take you on a musical journey through four generations of the Sherman Family. He is a talented songwriter and has written songs and/or scripts for film, TV commercials and the stage. Robbie is the son of the late great Robert Sherman, from the famous Academy Award winning Disney songwriting team, the Sherman Brothers. He will also discuss the book he edited for his father, “Moose,” Chapters of My Life and a new book written by his late grandfather, Tin Pan Alley songwriter, Al Sherman. “Moose,” Chapters of My Life will be available for purchase and signed by Robbie Sherman during the event on March 15th.Contact Adria Smith for more information at Bsmith9953@aol.com or call 407-256-3936. Tickets are just $50 for this amazing, intimate event and only a few remain. You don’t have to be a Disneyana Fan Club member to attend. To get your ticket, you will want to make out a check – payable to World Chapter Disneyana Fan Club. The last day for ticket sales is February 15, 2015 – so don’t wait!! If you want to save the stamp – message me on facebook for details on how to pay via paypal. Click on the graphic below to be taken to our interview with Robbie on the Disney Parks Podcast. ← “Inside Out” Themed Holiday Activities! We Are THERE,, can’t wait,,Thanks Krista ..